by Abraham Burickson and Ayden LeRoux, with contributions from Rick Moody and short story by Amy Hempel. Published by Princeton Architectural Press, 2017. Get it by itself or with the Library of Experiences below. Our latest project, the Library of Experiences, is a curated online catalog with sets of instructions for creating experiences of wonder and beauty for yourself or others. Your membership comes with an eBook of our publication Isolation and Amazement and our a hard copy of Odyssey Works: Transformative Experiences for an Audience of One. Gift envelope option available. by Ayden LeRoux, with contributions Abraham Burickson. Designed by Sasha Wizansky. Published by Samasara Press, 2012. 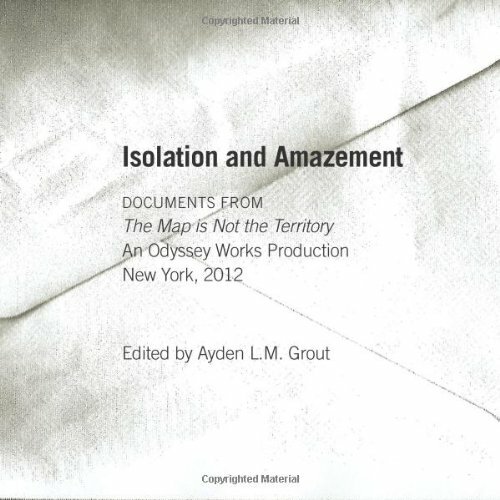 Isolation and Amazement offers insight into the contemporary art practice of Odyssey Works, a group that probes the relationship between audience and artist by making deeply affective work for an audience of one. This artist's book documents and traces the experience of the participant, Carl Collins, with photos, drawings and writings from the 2012 production The Map is Not the Territory. Providing an intimate cross-section of the Odyssey, it highlights both the ephemeral and material aspects of the production. The participant's own perspective alongside reflections by the artists involved offer rare insight into the theoretical and personal aspects of the work.